Luxury vehicles are usually known for their reliability and performance; however, any car, no matter how well-made or engineered, will encounter performance issues if it’s not properly cared for. Part of ongoing maintenance sometimes entails a little research about how our cars work and what we might need to look out for as owners of a particular brand of vehicle. For instance, Mercedes vehicles tend to run into similar issues, despite drivers’ habits or conditions. This leads us to believe that certain cars have defects in their design and/or engineering that we must be on the lookout for and act preventively. One specific issue that Mercedes vehicles tend to run into is a clogged fuel tank screen filter. Let’s talk a little more about what a fuel tank screen filter does for your Mercedes and when it might be time to replace it. What Does the Fuel Tank Screen Filter Do For Your Mercedes? 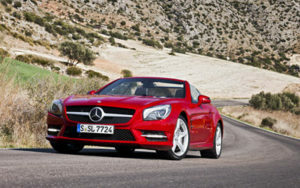 Mercedes vehicles are well-equipped with parts that act as buffers to engine and performance issues. This is also true of your Mercedes’ fuel tank. Just as any filter does, your fuel tank screen filter is another method of separating out large debris, dust, or other particles that could cause your fuel tank or flow to become compromised. When the fuel tank screen becomes clogged with debris, it can cause significant fuel efficiency issues which inevitably inhibits the proper flow of gasoline to your engine. Since there are several filtration systems your fuel goes through, it’s important to rule-out the other filtration devices as potential causes of fuel flow efficiency. The good news is that the fuel tank screen filter is designed to last a long time, so replacement usually isn’t necessary unless it is clogged beyond repair or damaged in any way, lessening it’s efficiency. Engine misfiring is typical when fuel filters become clogged, inhibiting the flow of adequate fuel to the engine for proper combustion. Misfiring is usually most noticeable when your car is carrying a heavier weight than normal. Since the engine requires more fuel in order to carry the load, fuel filter issues become evident under such conditions. Hesitation on ignition is another common sign that your fuel tank screen filter could be clogged, or not performing properly. Since the engine demands a specific amount of fuel to start, if the fuel pressure is lowered due to clogged filter(s), then your engine might not be able to start smoothly. This is also true when you need to accelerate quickly—the engine might not be able to meet the fuel demand and hesitate upon acceleration. Like all other vehicles, your Mercedes has a designated maintenance plan that was designed by the manufacturer for optimal performance. When drivers aren’t able to keep up on the routine maintenance, it can be damaging to the engine or other systems, such as the fuel system. Checking fuel filters for clogs and evaluating the overall condition of your car each time you bring it to the mechanic is a good way to prevent fuel filter issues. Be sure to consult with your reliable automotive specialist on what maintenance intervals work best for you and your unique driving habits/conditions. At Foreign Automotive, we service all Mercedes models in Kitchener, Waterloo, and Cambridge, ON. We have a passion for European imports like Mercedes, and it is our pleasure to service and repair them for our clients with quality, expertise, and efficiency. If you’re experiencing any issues with your Benz, you can schedule an appointment on our website or call us to speak to a Bosch certified technician about your Mercedes’ symptoms. *Mercedes SL on Road image credit goes to: supergenijalac.